OAKLAND (KRON) — Oakland teachers are hoping some political pressure will help get them a better contract offer. One day after 95 percent of Oakland teachers voted to authorize a strike, teachers and their supporters rallied outside Oakland City Hall Tuesday afternoon before speaking out at tonight’s council meeting. Council President Rebecca Kaplan has put forth a resolution in support of the teachers and their call for more pay, more student support, reduced class size and maintaining neighborhood schools. Teachers say they need the council’s help. “Our students have been ignored for a long time as have our teachers and we really need to speak up and speak to the city and be aware of what is going on,” said Oakland teacher Quinn Ranahan. Another Oakland teacher says the city isn’t looking out for students. The school district supports giving teachers raises but the question remains how much it can afford. an independant fact finder will issue their report on Feb. 15 and then it will be up to the teachers to decide if and when they will stage a walkout. 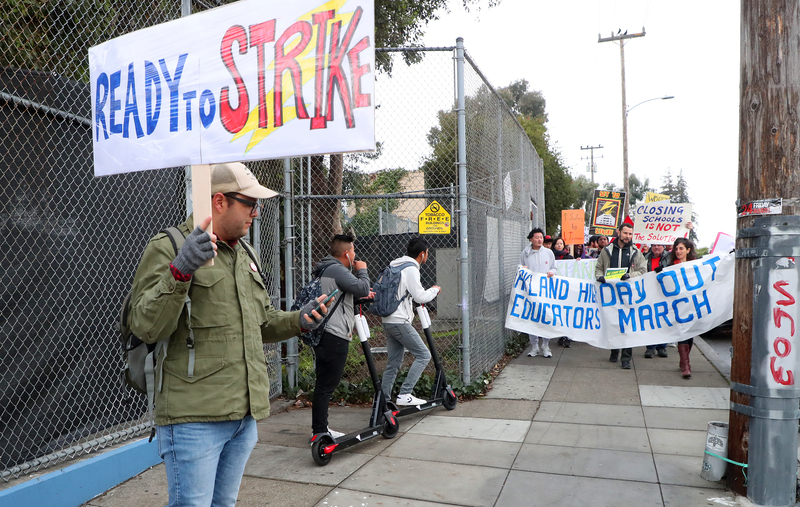 One day after 95 percent of Oakland teachers voted to authorize a strike, they are keeping up the pressure to get a fair contract. Posted in Accountability, Advocacy, Bus Safety, Department of Education, Education Budget, Educators Protest, Evaluations, Every Student Succeeds Act, Funding For Education, Higher Education, Janus, Mental Health, No Child Left Behind Act, Online Education, Parents, Pension & Salary, Retirees, School Choice, School Closings, School Safety, Special Education, Students and Parents Protest, Teacher Evaluation, Technology in the Classroom and tagged "Standing Strong for Public Education", #iBelieve, Accountability, Accountability System, Advocacy, Department of Education, Diversity, Education, Education Funding, English Language Learners, Equity, Every Student Succeeds Act (ESSA), Failing, Failing Schools, Federal Education Policy, High-Needs Students, NEAExecutiveCommittee, Pension, Pensions, Public Education, School Choice, School Nurses, School Safety, State Budget, Students, Tax, Testing and Accountability. Bookmark the permalink.